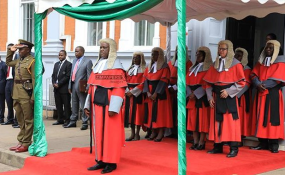 Chief Justice Malaba said the Judiciary was unyielding in its fight against corruption. "I ... wish to exhort the investigating and arresting agencies to thoroughly investigate cases before referring them to the National Prosecuting Authority," he said. "I further encourage the National Prosecuting to expeditiously attend to dockets and bring them to court for trial. "Prosecutors and legal practitioners must never forget their duties towards the courts; they are, above all, officers of the court. "They owe it to the Constitution and to the nation to ensure fair presentation of cases, ethical conduct in the courts and to assist the courts to arrive at just decision." "It (corruption) is perpetrated by sophisticated and well-resourced individuals," he said. "These extraordinary offenders therefore require extraordinary ways to stop them from further compromising the administration of justice." "It is necessary therefore to follow due process after the arrest of a person suspected of engaging in corruption," said the chief justice. "As the judiciary we maintain our stance that cases of corruption must be dealt with decisively within the confines of the law by the courts. "This does not, in any way, imply trampling upon the rights of those accused of corruption and related offences." "It simply requires lawyers, judges and magistrates to take cognisance of the harmful effects of the scourge of corruption on the livelihood of all Zimbabweans, if we do coalesce around this scourge, we all stand to be doomed as a nation."